Where do we stand as digital marketers when it comes to CBD? A good starting point is to understand what the product is and its potential impact on the global economy. CBD stands for cannabidiol, and it is produced from the part of the cannabis plant. 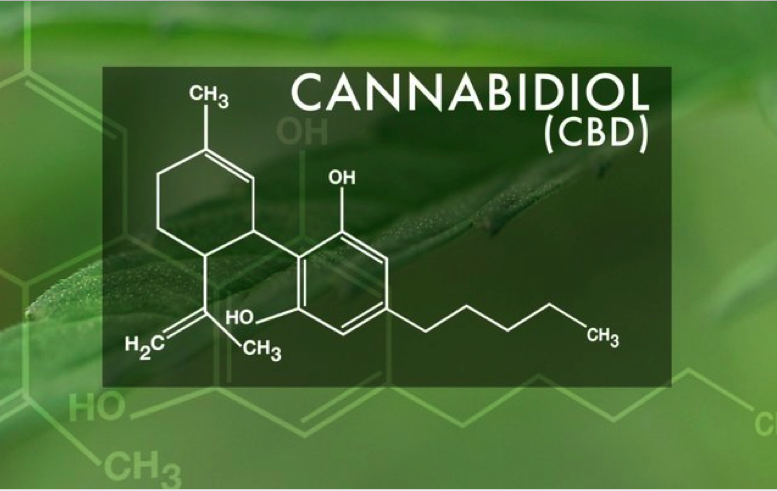 Cannabidiol (CBD) is a naturally occurring cannabinoid constituent of cannabis that is typically used for medicinal purposes. The production and distribution of hemp derived CBD products are perfectly legal in the United States. Cannabidiol is particularly useful for the treatment of Epilepsy, Alzheimer’s disease, Schizophrenia, Arthritis, Parkinson’s, Anxiety, Depression, and other maladies. The CBD market has already hit around $1 billion in 2018. As per a report from the Brightfield group, the CBD market is set to reach $22 billion by 2022. Another analysis from Technavio predicts that the global CBD oil market will grow at a CAGR of 39.19% during the period 2017-2021. Companies have already started investing in products that makes CBD accessible to all. The HempSMART mission by the Marijuana Company of America has launched a product named hempSMART™ which will be among the first CBD products to be marketed on a mass national TV commercial. It has analgesic (pain relieving) properties. CBD directly interacts with brain receptors and helps to reduce inflammation and pain. CBD has anti-seizure properties and people who have received CBD treatment have known to reduce seizure by a median of 38.9%. With amazing anxiety relieving properties, CBD treatment substantially reduces subjective anxiety. CBD has an anti-tumor effect and can effectively assist in the killing of tumor cells in both colon cancer and leukemia. As per a report published in the US National Library of Medicine, it was found that CBD was effective in reducing the instance of diabetes. The report stated that cannabidiol (CBD) lowers the incidence of diabetes in young non-obese diabetes-prone (NOD) female mice. CBD is also found to be useful in sleep disorders and appetite or weight loss. It can be taken as a pill for the treatment of anxiety or chronic pain. It can applied on the skin as a lotion for treating pain or inflammation. It can be applied as a tincture for treating insomnia or depression. It can be taken in the form of an e-cigarette for treating nausea or anxiety. The new way is to ingest it using CBD GUM. CBD has certainly become a major part of the entire Cannabis industry. There is an increase in demand for Cannabidiol (CBD) and Hemp based products that will push the market into new territories in the next coming years. According to a report published by New Frontier Data, the U.S. CBD industry grew by nearly 40% in 2017, reaching USD $367 Million in sales across hemp-derived and marijuana-derived markets. 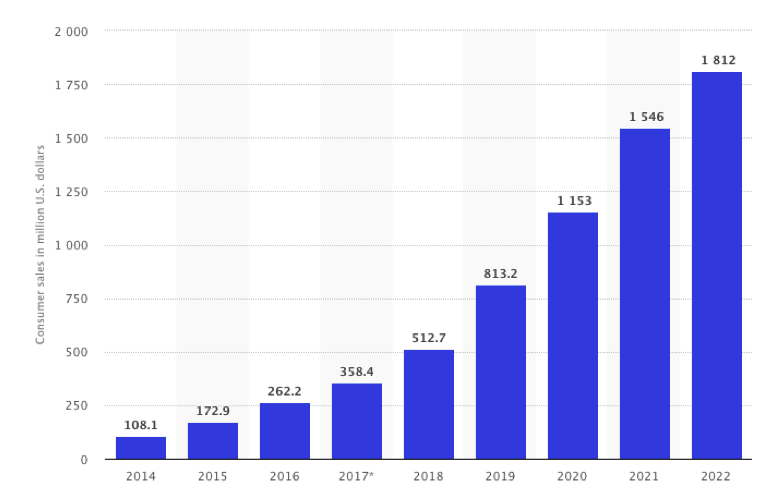 The below statistic from Statista shows the total U.S. consumer sales of CBD (cannabidiol) between 2014 to 2106, and estimates until 2022, in million U.S. dollars. It has been estimated that by the year 2020 CBD consumer sales will total around 1.15 billion U.S. dollars. It is important to note that CBD is not allowed to be sold or marketed as a dietary supplement and is instead classified as “authorized for investigation as a new drug”. The opportunities in the area of marijuana selling is tremendous states such Colorado and California has legalized the selling of marijuana and countries like Canada have already legalized it for both recreational and medical use. There is new pending legislation in the United States that if passed, would make Hemp 100% legal. This opens up even more possibilities for the CBD market. Major market leaders like Medical Marijuana Inc., Isodiol, ENDOCA, Chineseinvestors.com, and Gaia Botanicals, Aurora Cannabis, Elixinol, NuLeaf Naturals, CV Sciences, Cannoid etc are all making big moves to produce and market CBD in the coming months making it a mass movement. The movement extends beyond the pharmaceutical industry. Brands such as Coca Cola are planning to launch cans of cannabis-infused wellness drinks to consumers in order to have a share in the growing market of CBD beverages. With major players already in the market, the CBD stocks are at a all time high in the marijuana market. A stock in hand can give investors a tremendous considering the fact that the growth rate in the next 5 years is expected at 55%. CBD is certainly the drug of the future because people are preferring natural substances over pharmaceutical drugs . CBD perfectly fits into this category. People have already started to believe that hemp drug has miraculous capabilities and can prove to be wonder drug for treating a variety of ailments. Hence, it is safe to assume that he CBD market will soon reach the $20 billion target by 2020. Thats a lot of dough for us marketers. What a time to be alive.